Ordinance No. 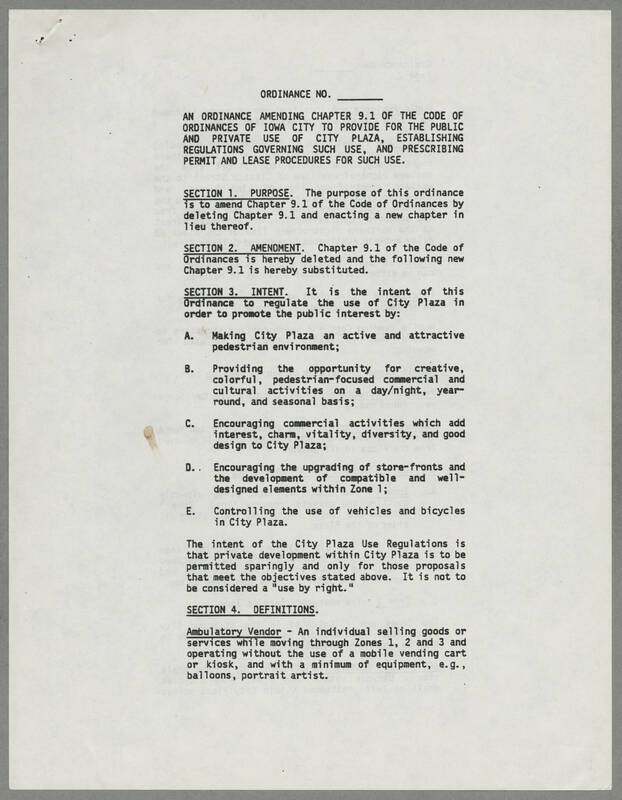 ____ AN ORDINANCE AMENDING CHAPTER 9.1 OF THE CODE OF ORDINANCES OF IOWA CITY TO PROVIDE FOR THE PUBLIC AND PRIVATE USE OF CITY PLAZA, ESTABLISHING REGULATIONS GOVERNING SUCH USE, AND PRESCRIBING PERMIT AND LEASE PROCEDURES FOR SUCH USE. SECTION 1. PURPOSE. The purpose of this ordinance is to amend Chapter 9.1 of the Code of Ordinances by deleting Chapter 9.1 and enacting a new chapter in lieu thereof. SECTION 2. AMENDMENT. Chapter 9.1 of the Code of Ordinances is hereby deleted and the following new 9.1 is hereby substituted. SECTION 3. INTENT. It is the intent of this Ordinance to regulate the use of City Plaza in order to promote the public interest by: A. Making City Plaza an active and attractive pedestrian environment; B. Providing the opportunity for creative, colorful, pedestrian-focused commercial and cultural activities on a day/night, year-round, and seasonal basis; C. Encouraging commercial activities which add interest, charm, vitality, diversity, and good design to City Plaza; D. Encouraging the upgrading of store-fronts and the development of compatible and well-designed elements within Zone 1; E. Controlling the use of vehicles and bicycles in City Plaza. The intent of the City Plaza Use Regulations is that private development within City Plaza is to be permitted sparingly and only for those proposals that meet the objectives stated above. It is not to be considered a "use by right." SECTION 4. DEFINITIONS. Ambulatory Vendor - An individual selling goods or services while moving through Zones 1, 2 and 3 and operating without the use of a mobile vending cart or kiosk, and with a minimum of equipment, e.g., balloons, portrait artist.